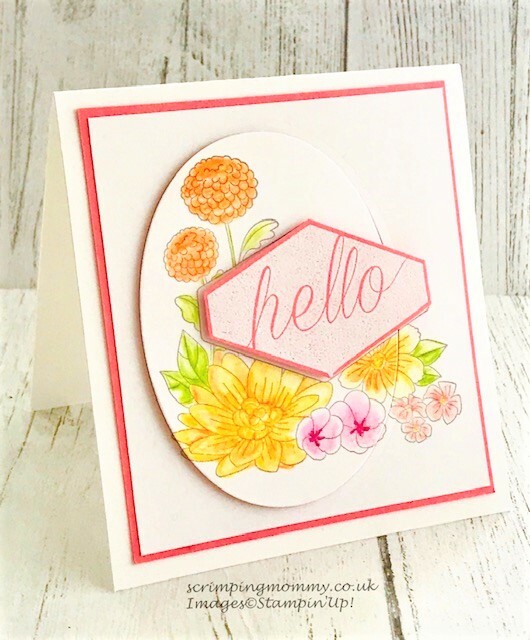 scrimpingmommy: Accented blooms hand coloured card. Accented blooms hand coloured card. No I am no Picasso... but I love to think I can play at being arty. My favourite arty play time is when I am using Stampin' Up! watercolour pencils. These are so nice to use and so easy. The colours are vibrant and fun and easy to blend out to make your image look awesome. Here is how I recently used the watercolour pencils. 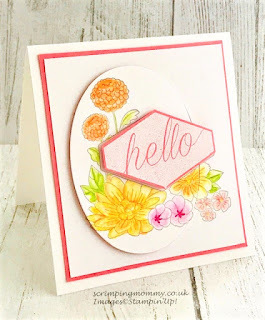 I creates a simple card using the stunning accented blooms bundle. I stamped on my card first , then partially stamped the same image on an oval die cut. I coloured the image on the oval and the parts I knew would be visible on the card base using Stampin' Up! blender pens to make my colouring look seamless. Now you can stamp both at the same time , or mask it off but I find there is less margin for error by simply stamping it twice. I embossed the sentiment onto Calypso Coral card using white powder, I was impressed how crisp the font remained. I popped the oval up on dimentionals and positioned so the two images over lapped but lined up perfectly. Then glued on my sentiment. A little more time goes into a hand coloured card, but the effort is very rewarding. I hope you will give it a try. I hope you have a fantastic weekend and get lots of crafting done. All content on this blog is the the property of Amanda Charlesworth, Stampin' Up!® Independent Demonstrator. Classes, services and products offered here are not endorsed by Stampin' Up!®. Projects, photos, ideas and articles are shared for personal use only and may not be removed duplicated, or copied without permission. Designed by Catherine Carroll. Simple theme. Powered by Blogger.